I felt rather incomplete after my earlier post in the day. Yes, one list of 10 songs does not do her any justice. So another list it shall be – of ten of my favourite duets. 1) Kya Ho Jo Phir Din Rangeela Ho (1957, Nau Do Gyarah, SDB, Co-singer: Asha Bhosle) : Geeta Dutt sang some wonderful songs with Asha Bhosle. May be it is their versatility and ability to convey the right emotions and modulate their voices accordingly. They played off each other very well and their songs together are absolutely delightful. This is my favourite Geeta-Asha duet. Filmed on Shashikala and a gorgeous Helen, this is from the Navketan film Nau Do Gyarah. A delight to listen to, it has been picturised beautifully. 2) Phulwa Band Mehke (1959, Hum Bhi Insaan Hain, Hemant Kumar, Co-singer: Suman Kalyanpur): This is a melodious song from a lesser known film of the 50s. The lyrics are by Shailendra and the music is by Hemant Kumar. There is a lyrical sweetness to the entire song – be it the lyrics in Hindi, the soothing music and the sweet voices of Suman and Geeta. The video of this song is not available but the audio, thankfully is. 3) Ho Lakh Museebat Raste Mein (1957, Pyaasa, SDB, Co-singer: Mohd Rafi): Pyaasa is one film that turns up in most of my posts. It is a film I do not tire of watching and a musical masterpiece at that. 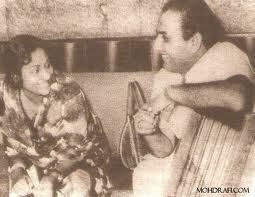 Geeta sang 3 amazing solos in this film and had two duets with Rafi (Hum Aapki Aankhon Mein and this one.) This short duet is in flashback. Vijay is coming out of his publisher’s office and he spots Meena, his college sweetheart who is now married to someone else. And he reminisces their brief erstwhile romance – the irony very evident as the song is all about how they shall stay together despite trials and tribulations. My one complaint is that this song is way too short. Does a longer audio version exist? 4) Rimjhim Ke Tarane Leke Aaye Barsaat (1960, Kala Bazaar, SDB, Co-singer: Mohd Rafi): This Navketan film had a memorable soundtrack by S.D. Burman. The charming film starred Dev Anand, Waheeda Rehman and Vijay Anand and is still remembered for songs like Khoya Khoya Chand (Oh, Rafi’s voice in this one… sigh! and the guitar and flute…) and Sach Hue Sapne Tere. This romantic duet is a rain song. Dev meets Waheeda again and they both remember their past meetings. What a lovely, mesmerising number, sung so beautifully by both Geeta and Rafi! 5) Mujhko Tum Jo Mile Yeh Jahan Mil Gaya (1958, Detective, Mukul Roy, Co-singer: Hemant Kumar): Continuing with the romantic tone of the previous song, here is another dulcet, lyrical, romantic song. From the film, Detective, this was picturised on Pradeep Kumar and Mala Sinha. A soothing, lyrical song and such sweet voices! 6) Aankhon Hi Aankhon Mein Ishaara Ho Gaya (1956, CID, OPN, Co-singer: Rafi): What a wonderful soundtrack, this movie had. The other Rafi-Geeta duet in this movie was the unforgettable Aye Dil Hai Mushkil Jeena Yahan, picturised on the inimitable Johnny Walker and Kumkum. But here is the other lilting Rafi-Geeta picturised on a dapper Dev Anand and a beautiful Shakeela! 7) Aankhon mein tum Ho, Dil Mein Tum Ho (1962, Half Ticket, Salil Chowdhary, Co-singer: Kishore Kumar): Half-ticket was an absolutely crazy fun film. It had Kishore Kumar’s antics, a very beautiful Madhubala and amazing music by Salilda. This is a peppy duet, fairly romantic, as Madhubala proclaims her love. 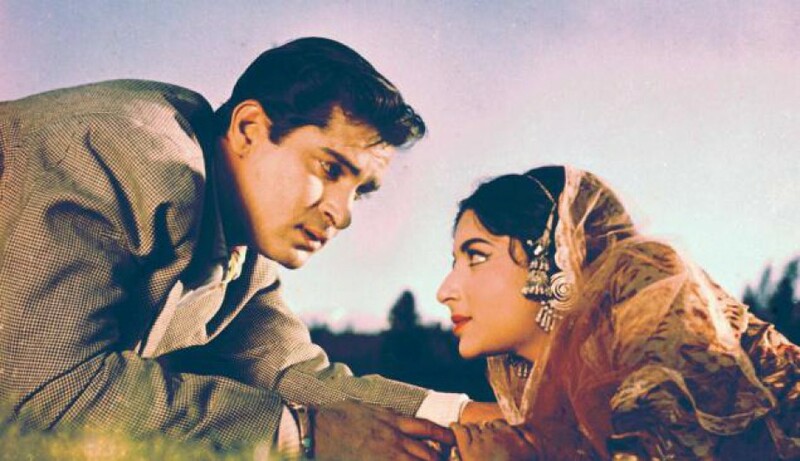 8) Tum Jo Huye Mere Humsafar (1958, 12 O’Clock, OPN, Co-singer: Rafi): One of my favourite OPN songs, this romantic number has a lovely tune and has been sung superbly by Rafi and Geeta. Waheeda Rehman and Guru Dutt lip synch this on screen. Simply fantastic. 9) Jhuki Jhuki Pyar Ki Nazar (1957, Johnny Walker, OPN, Co-singer: Asha Bhosle): Another Geeta-Asha duet, this time the music is by O.P.Nayyar. This is from a less known film called Johnny Walker (presumably with Johnny Walker as the male lead). The song is picturised on Shyama and some of her friends. A very sweet song. 10) Yaaron Kisi Se Na Kehna (1960, Chhabili, Snehal Bhatkar, Co-singer: Nutan): Tanuja made her debut in this movie produced by her mother, Shobhana Samarth. Her elder sister, Nutan starred in it and interestingly sang too. This song has Geeta Dutt crooning along with Nutan. While the video is unavailable, do listen to this very rare but sweet song! There are other Geeta Dutt songs that should have made it to this list of duets and the previous one on solos. And, maybe on another day they would have! But for the moment, these are my favourites! This entry was posted in Old Hindi songs and tagged Asha Bhosle, Chhabili, CID, Detective, Dev Anand, Geeta Dutt, Guru Dutt, Half Ticket, Hemant Kumar, Johnny Walker, Kala Bazaar, Kumkum, Mala Sinha, Mohd. Rafi, Nau Do Gyarah, Nutan, O.P.Nayyar, Pradeep Kumar, Pyaasa, Sachin Dev Burman, Salil Chowdhary, Shobhana Samarth, Shyama, Snehal Bhatkar, Suman Kalyanpur, Tanuja, Vijay Anand, Waheeda Rehman. Bookmark the permalink. A bouquet of beautiful song, Thanks dear! Thanks, Ava! 🙂 Geeta Dutt was a phenomenal singer, wasn’t she? Oh, good list, Harini! (And, yes: predictably enough, some of these songs would be definitely part of my Geeta duets list too: Kya ho phir jo din rangeela ho, for instance – I love that song to bits. Was singing it just yesterday). 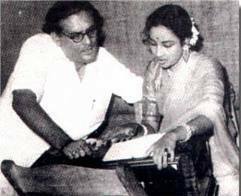 But there are several other Geeta Dutt duets that I also like a lot; Gumsum sa yeh jahaan (from Duniya jhukti hai for one, Chupke se mile pyaase-pyaase from Manzil, for another. Will make my own list, someday. Pingback: Carnival of Blogs on Golden Era of Hindi Film Music – December 2014 | The world is too small? or Is it?